Have you ever been brunching about when you come across an ebelskivers option? Don’t let the word intimidate you, it is a danish pancake in the shape of a ball and often filled with deliciousness of many kinds. It also happens to be one of my favorite foods on this planet. During a recent girls only brunch, I learned how to make these dainty delicacies from a dame of the kitchen, Eileen Haniszewski. The recipe was passed down to her from her mother-in-law and she has kindly decided to let us share it with all of you! 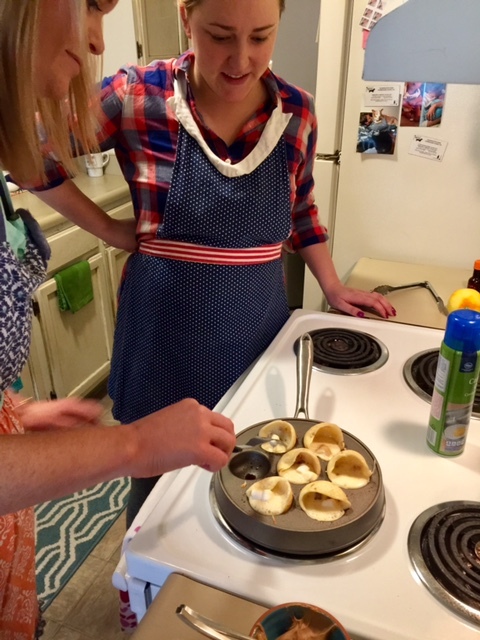 Ebelskivers aren’t just fun to make, they leave you in a sweet and satisfying coma. They are perfect as a breakfast appetizer, or for times when you need small bites to accompany your other early morning dishes. Eileen starts out in the kitchen by putting on her favorite apron to fully prepare for the culinary masterpiece she is about to ensue. You have to look the part of course. She then sprays her speciality ebelskivers pan with P.A.M. and lets it slowly heat up. 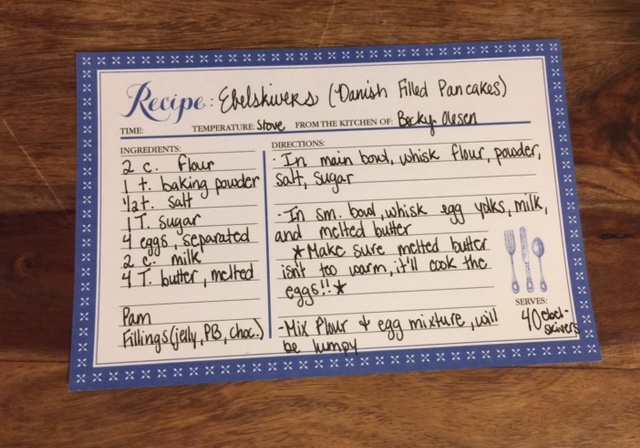 She begins to mix the batter using her beautiful recipe card below. 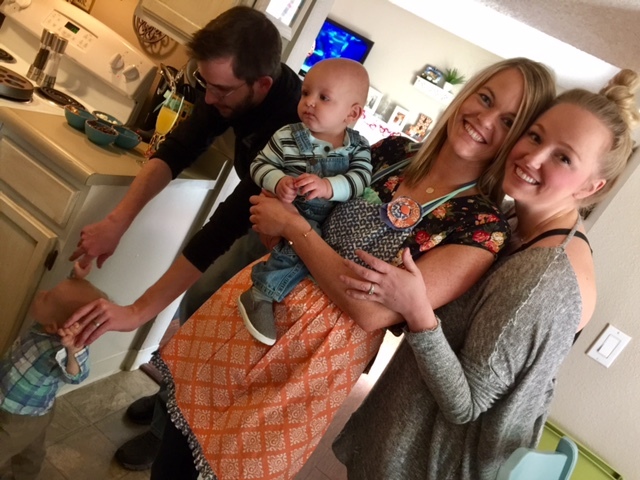 As you know, Denver She Wrote loves hand written recipes! The next steps include: Adding dry ingredients to one bowl, then egg yolks and egg whites in two separate bowls (pictured below). It is important to separate the egg yolk from the egg white for the proceeding steps. Add the milk and the butter to the egg yolk bowl. *Note: Make sure the butter is not too hot when you melt it otherwise it will start to cook the egg after you mix it into the yolk bowl. 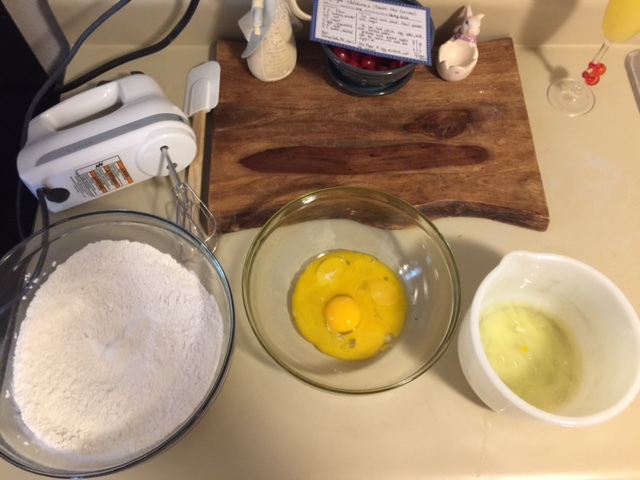 Continue by combining the egg yolk mixture into the dry ingredient bowl. Whisk this until the lumps are gone. 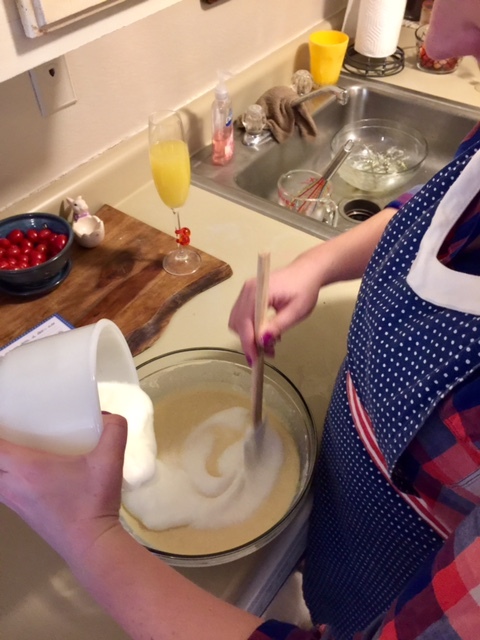 Next using an electric mixer to beat egg whites until frothy (be sure not to over do it to the point of being stiff). Lastly, slowly pour the froth with the rest of your ingredients, folding it in gently so you keep the fluffiness in the batter. Now the batter is ready for the stove! 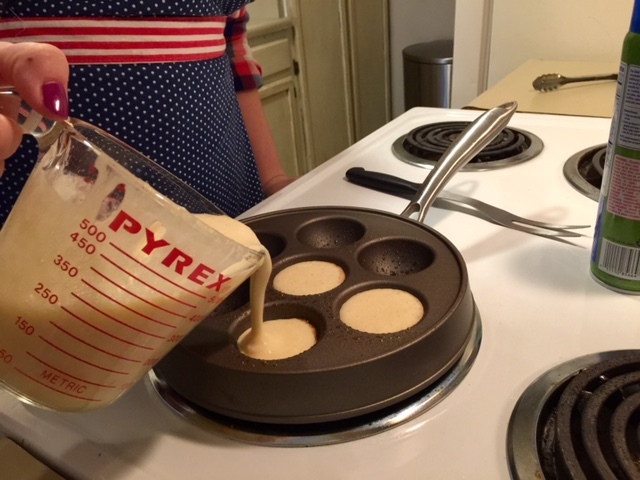 Carefully fill the holes in the ebelskiver pan. Do this quickly, as these lovely little balls cook pretty fast. If you want your ebelskivers to be filled, now is the time to add. There are so many tasty combinations. 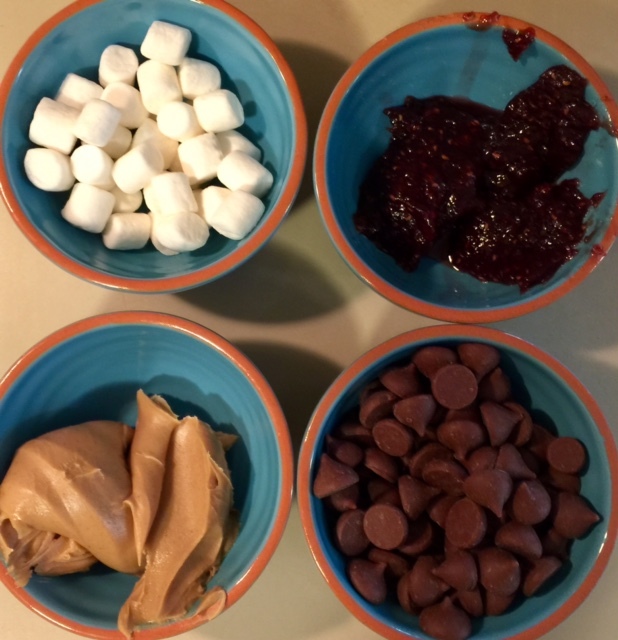 For our brunch, we opted to have chocolate chips, peanut butter, jam and marshmallows on hand. (Not pictured was bacon, brie, strawberries and bananas which also made for great stuffing combinations as well). This recipe gives you plenty of batter to try different combos, so get creative! 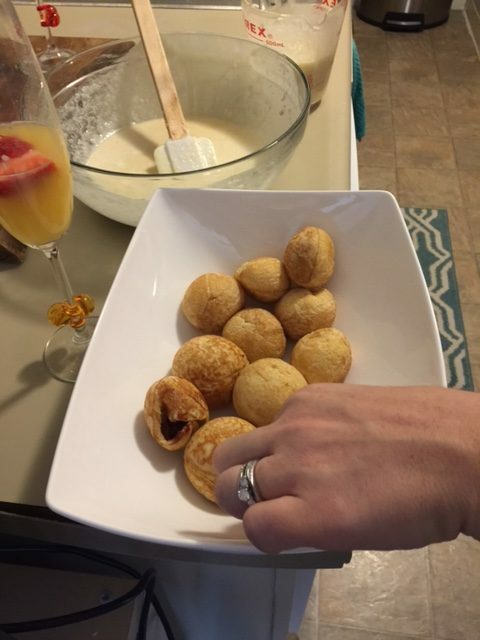 After about 15 seconds you will use a utensil (we used a carving fork) to jab the inside of the batter ball and give it a nice 50-90 degree rotation. Everyone has their own groove, but you just try to fill in the sphere a little more on each rotation to capture the inside ingredients and eventually close the circle of dough. The goal is to make it look like a little pancake ball! You will rotate 4 or five more times until the desired shape is achieved. Finally, place them in a cute dish and enjoy! This batch of ebelskivers went so fast I could hardly get photographic proof that they ever existed. These little pancakes are good plain or stuffed! They are a perfect breakfast item to make during the holidays, and are especially fun to make when you have friends and family around to enjoy the cooking experience with. 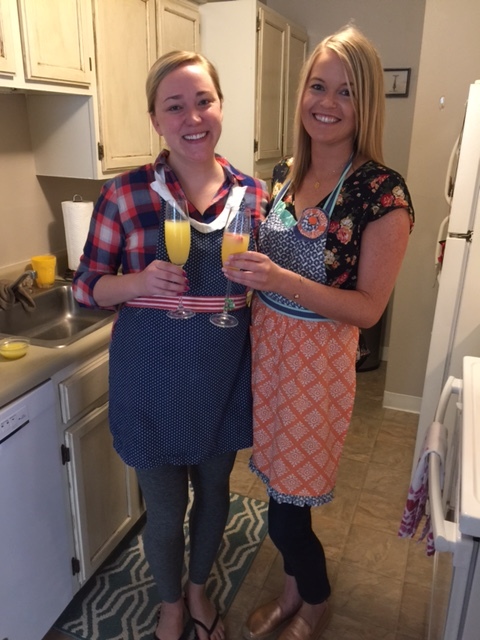 And as pictured, they are also great for brunching babes and bring entertainment to the masses… even the little ones!